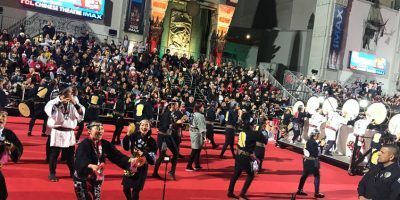 Los Angeles started off the Christmas season by hosting it’s 87th annual Hollywood Christmas parade which followed a 3.2-mile route along Hollywood Boulevard, then back along Sunset Boulevard. The event was hosted by Erik Estrada, Laura McKenzie, Dean Cain and Montel Williams, with co-host Elizabeth Stanton and Garrett Clayton. “Hosting the parade is always fun [and] exciting.” Clayton said. This year was even more special than the last because of the United States Marines. The gifts were donated by the Marine Toys for Tots Foundation that are given to less fortunate children all over the world. The parade took place in the heart of Hollywood, closing down every block from a three-mile range down Sunset Boulevard and Sycamore Street. Gigantic balloons in the shape of ornaments and favorite holiday characters such as the Grinch and the Cat in the Hat sparked the streets. Ripley’s Believe It or Not, Aquarium of the Pacific, and Knott’s Merry Farm were among the other sponsors. Partnership with Knott’s Merry Farm allowed the attendees to enjoy the appearances of Snoopy, Charlie Brown and Lucy on the red carpet. Sierra Clair, reporter from Hollywood Glam Magazine, asked Santa Claus what he was most excited for this Christmas. General Pete Osman, President and CEO of Marine Toys for Tots, gave both gentlemen a pat on the back. Popular artists, such as Ashanti and The Band of Merrymakers, strolled through the red carpet. Past American Idol contestants, Mikalah Gordon, Blake Lewis, Kimberly Caldwell-Harvey, David Archuleta and Elliot Yamin all sang classic songs like “Holly Jolly Christmas” and “God Rest Ye Merry Gentlemen.” Nancy O’Dell, Grand Marshal, was awarded a Certificate of Recognition from The City of Los Angeles. The Hollywood Christmas Parade will premiere December 14 at 8 p.m. on the CW Network and on Hallmark after the CW broadcast.